After germinating the marijuana seeds and you see that they have already fully sprouted, special care must be given to the young cannabis seedlings since they are very delicate during this stage. 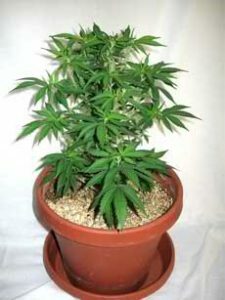 You can get a lot of information on how to grow marijuana from websites and forums but getting a complete how to grow weed book like the Growing Elite Marijuana eBook by Ryan Riley won’t give you any headache because it’s very comprehensive, complete and you don’t need to go online just to study how to grow your own weed. Now that the cannabis seeds have sprouted, the next thing to do is to take care of the seedlings so they can fully develop and turn into healthy and fast-growing weed plants. Some expert growers prefer the use of a propagator as the best option for an environment where a young seedling can thrive. After all, your cannabis seedlings need a consistent environment in order to grow in a healthy way. Having a consistent temperature, airflow and humidity is very important at this point. This is something that is provided by a propagator. Any alterations to the factors should be gradually done as much as possible in order to prevent shock, something which is possible with the use of a propagator. In its most basic form, you can create a propagator using any type of material which allows light to reach the seed, maintaining a constant environment by means of trapping humidity and heat inside it. A good option is using a clear plastic bag sitting over the top of a pot, with an attached elastic band. This type of propagator is cheap but effective. As the seeds start to germinate first, it is very important to maintain humidity levels of about 80%. You can do this by making sure that the humidity vents are kept closed, thus stopping the airflow, and preventing moisture from escaping. However, after all the seedlings have shown, you can open the vents gradually, a little bit every day, thus increasing the flow of air while decreasing humidity. This process is commonly called hardening and is important in preparing the seedlings for moving to the main room. It is also crucial in preventing damping off. After ten days, you can remove the cover, and the seedlings are now ready for transplanting. Cannabis seedlings are so delicate, so be very careful when transplanting them to your chosen medium to prevent stress on them. Upon putting the soil medium in the container, make a hole using a pencil. 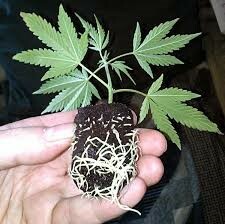 Put the cannabis seedlings in the hole with the roots side down and cover it with soil. Water them until the soil is moist but do not overwater to avoid drowning. Cannabis seedlings need only a very minimal light. The use of incandescent bulbs is not recommended because they put off too much heat. Young seedlings are best grown under LED lights, fluorescents and metal halides. The best way of how to grow marijuana plants is to start caring when they are still seedlings and providing just the right intensity and spectrum of light will give them a stronger root system. Once the seeds have germinated, and have already broken through the growing medium surface, they will start the photosynthesis process and should have light for at least 18 hours in a day. Even though it is completely possible to start your plants on the windowsill with the use of natural sunlight, this strategy comes with some problems. For one, the sun is not as reliably consistent when compared to a grow lamp. A sunny day is quite challenging to plan, and you may just end up returning home with some wilted plants. Your seeds are quite vulnerable at this point and may even wilt in just a few hours if the conditions are not prepared accordingly. Keep in mind that direct exposure to sunlight can easily fry your plants. If the natural source of light levels is poor, your seeds will naturally stretch out for light, thus leaving you with spindly, long plants which only develop smaller yields as expected. Keep in mind that if you are growing in an indoor environment, there is a need for you to maximize the available space under the lights. As much as possible, the plants should be kept squat and short until they are finally ready for the flowering phase. Otherwise, you may only just end up wasting your time on plants with long stems instead of having long buds. For this very reason, investing in a good lighting is the best way to go. When your plants are still very small, excessive light and heat can easily stunt their growth, even killing them. For this very reason, it seems not practical to start your seeds under an HID lamp. As mentioned, one of the best options is the use of fluorescent lighting. It is less intense, giving off less heat, which makes it more suitable. You can also take advantage of the propagation lighting that is available from a local shop. There are T5 propagation strips as well as CFL eco lights, both of them having an output in the white/blue spectrum. The use of this light will encourage your plants to cultivate roots and grow outwards instead of growing upwards. 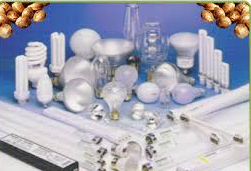 Fluorescent lamps are generally cheaper and operate easier compared to HID lighting. Also, because they also give off lesser heat, they may be placed close to the seedlings, thus wasting very little light. Adding fertilizer is not a requirement for the seedling unless you are growing them in a soilless medium. Watering schedule is usually twice a day for the first few days. The frequency of watering will also depend on the humidity level and temperature. Watering should be done a few inches base of the pot seedlings and not directly because the roots and the stem can easily be damaged. 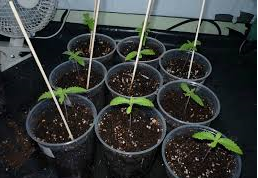 In a search for more information on how to grow marijuana, you also have to pay more attention on how to take care of the young marijuana seedlings because failure in this initial stage will not promote stronger root system and may eventually cause the seedlings to die. Before actually planting your marijuana seed, the growing medium needs to be moist, but not entirely saturated. This is a very important point that should be considered. Coco plugs or peat need to be soaked in water until fully expanding, and allowed to drain through the night. If you decide to use Rockwool cubes during the propagation, soak them well in a solution composed of a quarter strength of nutrient solution which has been adjusted to a pH level of 5.5, allowing them to completely drain overnight before use. The primary objective of the propagation process is to ensure the establishment of a healthy root zone. In order to make sure of this, it is recommended to understand the impact of water roots. The roots grow as a response to the depletion zones. When the root has completely absorbed the water available in a certain area of the growing medium, it will end up growing outward to look for more. At this point, therefore, it is very important to let the growing medium to completely dry out before you start re-watering them. This will also allow the roots to use most of the water and food presentation. When there are food and water available all the time, the roots will not have to look out for them. Still, it is crucial not to over water your seedlings, but it is still a balancing act since underwatering will also result in the roots dying back which can eventually limit the development of the seeds. As another note, it is very important to remember that your seedlings are still tiny and are most unlikely to require additional water or food for the very first 3 to 5 days right after the germination process. If you are in doubt, you can get a soil moisture meter in order to double check. Your first feed may be given to the seeds after the appearance of the first real leaves. These are usually the second set which develops after the process of germination. Make sure that you stay on the safe side when giving your feed as it is a whole lot easier to give extra food if your plant needs it, but it is often quite difficult to make corrections on overfeeding, especially when dealing with very young plants. Most growers make it a rule of thumb to read their plants. If the lower leaves begin to turn to yellow, it means that they are hungry. On the other hand, if the edges are curling or brown, they are most likely overfed. 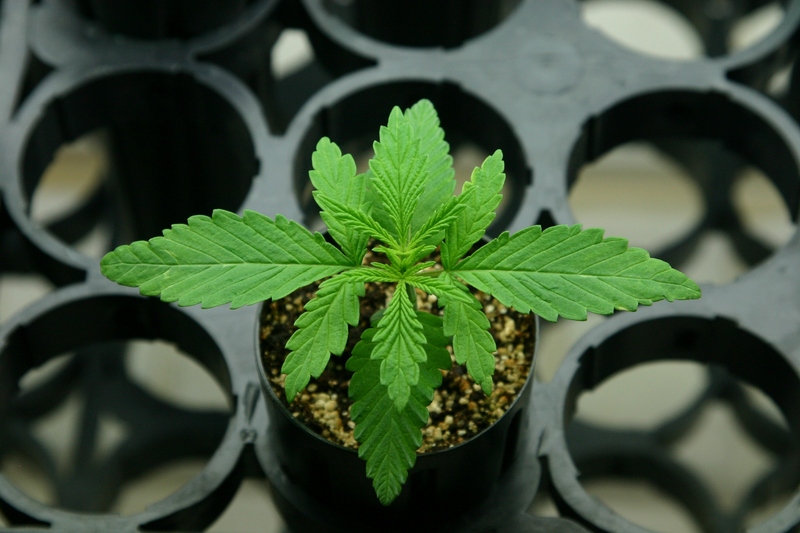 If you have started your marijuana seedlings using a propagation medium, such as pet, rock wool cubes or coco pellets, you can expect that in just 10 days of the germination phase, they will be now ready for transplanting. Even though the seeds started in just a small pot, they will be ready for moving within two weeks. The seeds will still be quite vulnerable at this very stage. Therefore, your primary goal is to potentially minimize the shock that they can feel during transplant. In order to achieve the best results, and so as to minimize the possibility of shock, you can simply transplant your seed into the very same grow medium that you used early on. For instance, if you germinated your seeds in soil, it would be best to transplant them to a soil pot. This will easily speed up the time in which your seeds can take to root in the new grow medium. However, there is an exception when using rock wool. Naturally, it gives an inert and sterile block which man be transplanted using any grow medium. Each of the blocks is uniform, so each of the seedlings will also grow consistently, and will be all ready for transplanting right at the same time. In contrast to common belief, when transplanting to a new grow medium, it is often a recommended idea not to water on that very day of transplanting. This is because there is a likelihood that your seeds will suffer some damage. At the same time, watering them immediately after transplanting can also bring in some pathogens to the already damaged roots. Therefore, in order to make sure that the transplanting of your seeds is done appropriately, it is best to wait for the next day before watering using plant stress reliever products, such as SuperThrive. Keep in mind that timing is very important in all of the phases, from germination up to this point of transplanting. Taking good care of your marijuana seeds plays a very important role in your marijuana growing project. Investing in this phase of the project can bring you closer to having bigger and better marijuana yields.